FOXTROT CHOPPERS is a simple-to-control, fun and blasting Choplifter-like sidescrolling helicopter game in a 90s 32-bit look, as if it was running on Playstation or Nintendo 64, with simple controls. Controls is close to the SNES Choplifter III with it's chopper turning via shoulder buttons. NOTICE: this is a very early demo version. The focus is on gameplay, not design. NOTICE: the actual version seems to have some bugs. It might be neccessary to quit the game (button on the upper right corner) and restart it if you want to change the game mode to get rid of the bugs. 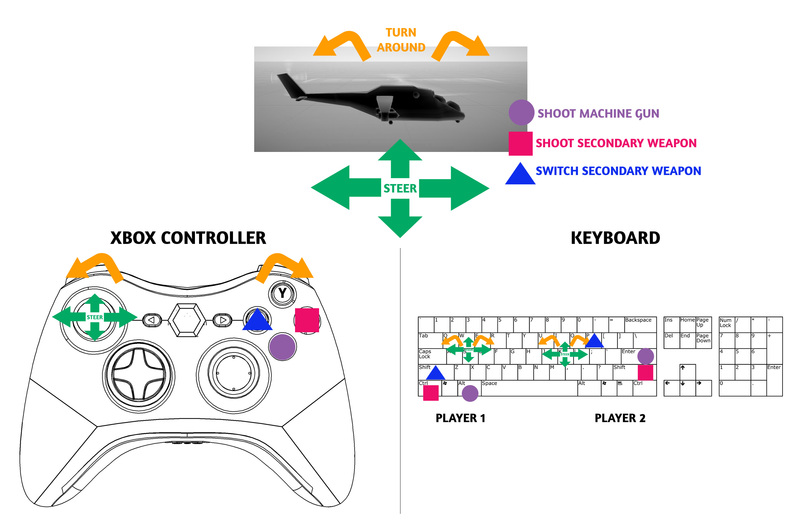 You can use gamepads and/or keyboard. 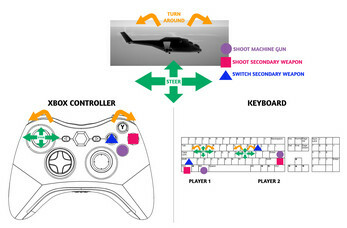 Please see the default settings for Xbox Controller and keyboard below. You can change the keys at the beginning when you start the game. Controls are oldschool like on a SNES gamepad. If you turned the chopper to the front position, you can shoot the MG down. Chosen secondary weapon is visualized for each player in the upper left box with an "M" (missile) or "B" (bomb) icon. I heard a lot of 70s/80s rock while developing and testing, and I find that Uriah Heep's "Easy Livin'" works best for it (loud and looped!). Wow, that was quick! Nice job!